The bitter adversaries having been trading barbs with one another through the media ever since their UFC 229 grudge match, which Nurmagomedov won via fourth-round submission. Nurmagomedov lit the blue touch paper on Tuesday by mocking Conor McGregor’s apparent retirement from mixed martial arts. “Tomorrow he will say that he comes back and all the media will talk about it. That’s what he wants,” Nurmagomedov during a Q&A in Russia. “I don’t think he’s finished. “He could not reach an agreement with the UFC and now wants to play this card. 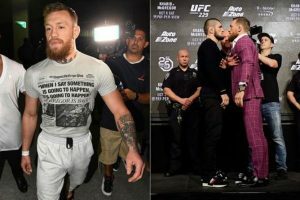 McGregor didn’t take kindly to Nurmagomedov’s comments and unleashed a deluge of tweets the UFC lightweight champion’s way on Wednesday morning. In the barrage, McGregor accused the 30-year-old of avoiding a rematch before firing a controversial shot at the Russian and his wife. The snap appeared to show Nurmagomedov’s wife wearing a veil to cover her face. McGregor’s tweet was seen by many as culturally insensitive, with some accusing ‘The Notorious’ of racism. And shortly after seeing the pair’s unsavoury back-and-forth, UFC president Dana White issued a statement on the matter. “I am aware of the recent social media exchange between Khabib Nurmagomedov and Conor McGregor,” White said in a statement to Yahoo Sports’ Kevin Iole. White then went on to reveal the UFC brass will reach out to both fighters and their respective teams to de-escalate the situation. Less than an hour after White issued his statement, McGregor fired another shot Nurmagomedov’s way. McGregor, 30, is currently on the sidelines due to the suspension he received for his actions in the brawl which followed his UFC 229 loss to Nurmagomedov. He’s eligible to return to action from April 6 onwards, though his future in the mixed martial arts is up in the air as he appeared to retire from the sport last week. After declaring his retirement on Twitter, White wished the UFC’s first simultaneous two-weight world champion all the best with his future endeavours. However, White now no longer believes Ireland’s first UFC belt holder has hung up his gloves. “No,” White said during an appearance on 8 News when asked if he believed that McGregor was truly retired.